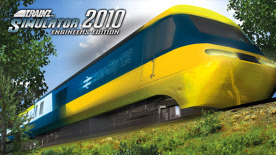 SpeedTree® - New to Trainz Simulator 2010 is the inclusion of SpeedTree®. High Quality and detailed trees breathe new life into your routes and bring your worlds to life. Check out the tech video on the left for information on SpeedTree. Customizable Menu System - The Trainz interface has had a thorough overhaul, bringing a more friendly and intuitive interface to your screens. Along with the usability improvements, content creators can also create their own menu items for their routes and sessions. Routes - New routes are available for you to drive with upgraded content specific to TS2010 and including SpeedTree® throughout. Developed specifically to run in 'Native' mode, experience the best Trainz® ever. Seasonal Asset Support - Support has been included to allow the creation of Seasonal Assets. Switch between different seasons and observe as the compatible objects change appearance. All Modules Included - Use all three of the Trainz® game modules - Driver, Surveyor and Railyard.